In any market, it can be daunting to write up your CV – whether you’re looking for your first job, or simply haven’t been on the job search for a number of years. When any of my Payroll candidates come in to register with HRC, I always take time to talk them through their CV and offer any pointers where needed. So often, a poorly laid out CV or one that is missing vital information can be stacked against a candidate. By getting yours in shape, you stand a better chance of progressing to interview. Take a look at the infographic below for my top CV tips. 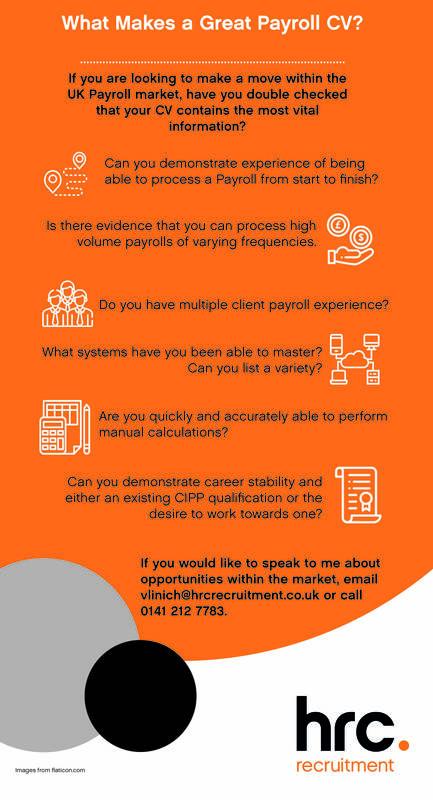 Click here to get in touch with me to discuss available opportunities in the UK Payroll market.